This detailed stencil was snapped by my favourite photographer MK at the weekend. It was splashed on this wall by 2026 (also Bondi's postcode), just in time for Valentine's day this year. 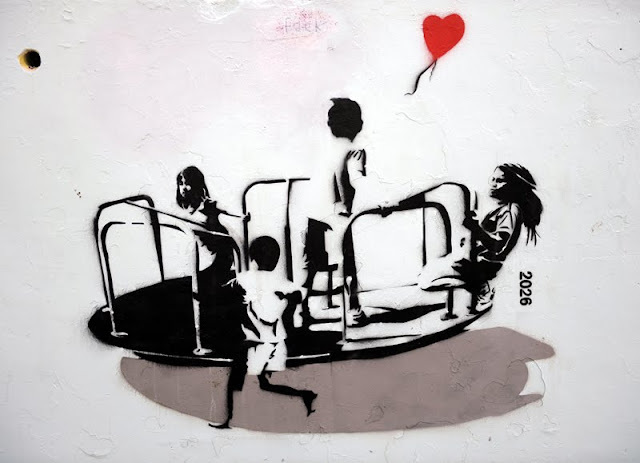 It depicts an ethnically diverse group of kids on a merry-go-round. They look serious. Two, which appear to be girls, look toward the left of the frame. The other two, boys presumably, look away from the viewer toward a heart-shaped helium balloon. Seems love is hard to find, even when you're looking around. Note the facial details and shadow play in this piece - top shelf. Sadly, it has also experienced some hardship. 2026, if you're reading this, get in touch and we'll smash some Bondi Beach Burritos. hey hi! i got the same picture, with a blue background :). looks a bit like banksy style, but i don't think that's him... do you know?